One of my favorite things to do at work is help a reader find a book. Reader’s advisory is a work in progress. Sometimes helping find that perfect book for a patron is a hit and sometimes a total miss. Adults pretty much know their tastes and what they enjoy without batting an eye. The challenge is when middle graders and young adults come in and are stuck. Especially when it comes to nonfiction. I’m not talking about finding books to do a report. No brainer there. But reading nonfiction for pleasure. To be honest, it’s rarely requested. And I understand it because, I also have a very difficult time reading nonfiction for fun. I feel as though I’m dissecting a textbook back in school. Unless it’s a memoir, I have real trouble sticking with nonfiction. I truly think it has to do with not being exposed to nonfiction at that age unless it was for a research project. I’m not talking about elementary children. There is never an issue interesting kids at the younger age to read books about bugs, animals, gross things, knights and the like. As a teacher I could never pry away those books from their hands and get them to read more fiction. In undergraduate college during a Children’s Lit course, we were advised to be careful when to introduce nonfiction because they wouldn’t go back to fiction once they had opened up the world of facts and everything around them. But then this wonderful thing happened at the library. We started receiving more and more nonfiction books that were originally written for adults adapted for the younger readers. And I’m reading them, too! 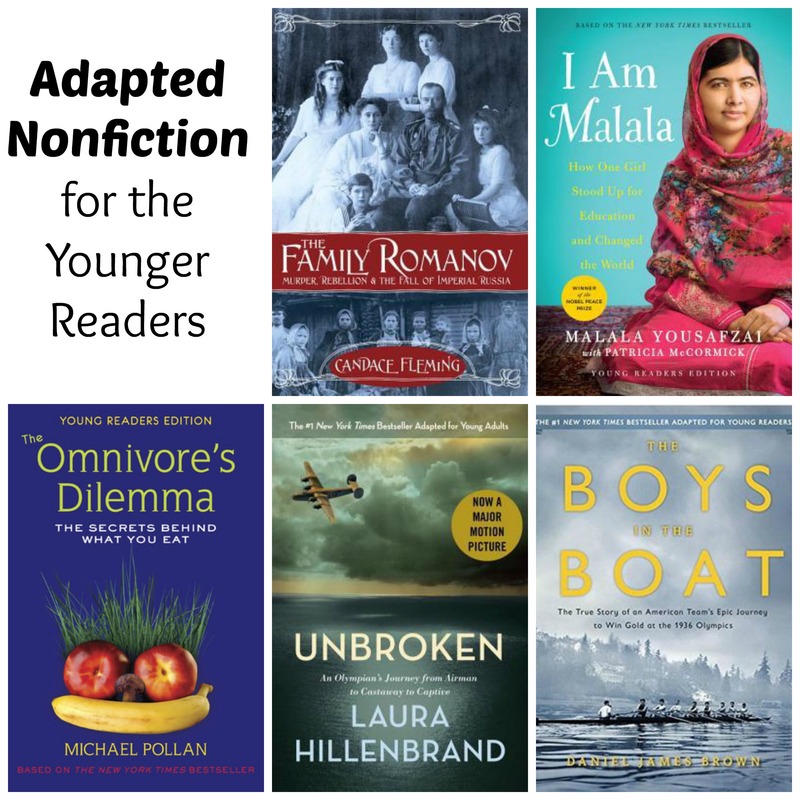 If you know of a middle grader/young adult who would like to read more nonfiction about people and things that really matter, give these a try. It’s also important to expose children to as much literature as possible without being in the realm of “must read” as in the case of class assignments. I have a real bone to pick with having my kids read “only 20 minutes a night” like it’s a punishment for homework. (But that’s another post). The Family Romanov – Candace Fleming (2014) 304p. I heard about this young adult version at a recent nonfiction book event for children and immediately put it on my TBR list. I’ve always wanted to read about the famous aristocrats that were all murdered in 1918 Russia. My coworker blew through this version and now it’s my turn. *Ages 12 and up. The Omnivore’s Dilemma – Michael Pollan (2006) 352p. I LOVE Michael Pollan and love that he is so realistic when it comes to food. No shaming or converting eaters into extremists. Just good old fashioned knowledge of where your food comes from and to support those farmers who are doing it right. *Ages 11 and up. The Boys in the Boat – Daniel James Brown (September 2015) 240p. Coming in September 2015 and has high interest already. *Ages 12 and up. *Like with any books suggested here for young readers, use your own judgement in the appropriateness for your audience. Ages are suggestions based on NoveList which uses reviews from School Library Journal, Kirkus and Publisher’s Weekly. As an adult, pick one up and rekindle your love for nonfiction. Tags: Candace Fleming, Daniel James Brown, Laura Hillenbrand, Malala Yousafzai, Michael Pollan, nonfiction for younger readers. Bookmark the permalink.